I won't be alone for Valentine's Day tomorrow after all, because last night the roommate and I compulsively brought home two new pets. We have named them Ron and Harry. If you can't figure out which one is which, leave now. We were at Wal-Mart picking up a few necessities. I was looking for banker's filing boxes, not quite knowing where to look, and so I was just wandering around. I passed by the fish and just knew I needed one. I walked up to my roommate, who was looking at lotions, and I told her, "we're getting fish." We picked them out and giggled like little girls as the employee scooped them out of the tank and put them in a bag for us. We carried the fish across the store to the craft section, and we actually found marbles in Gryffindor colors. Geeky, I know, but marvelous. As we were walking past the office supplies, I held the bag up and said, "Aww, look, they're bonding!" A man in the shoe aisle gave me the most ridiculous look I've ever seen. Seriously, some people don't know how to live. Anyways, tomorrow is Valentine's Day. I fully intend to stay in bed and read all day long until I have to go to work at 6:00. In honor of the occasion, however, I started to write some love letters, which then turned into general random letters. By the way, those notes above were for Twenty Something Bloggers' February Carnival, yay! On a serious note: I'm wearing red & black today and tomorrow in honor of the students that were killed at NIU last Valentine's Day. Update as of 6:15pm: Harry has died. We gave him a nice send off to toilet Heaven. If Ron doesn't make it, then we will surely know that ants are the only pets we can keep alive. No, Harry! I'm sorry, friend. I mourn his passing with sorrow. I'm sorry to hear about your loss. Fish are difficult pets to keep (alive). I once had a fish named Maria Barteromo, who died on the way home from the store. 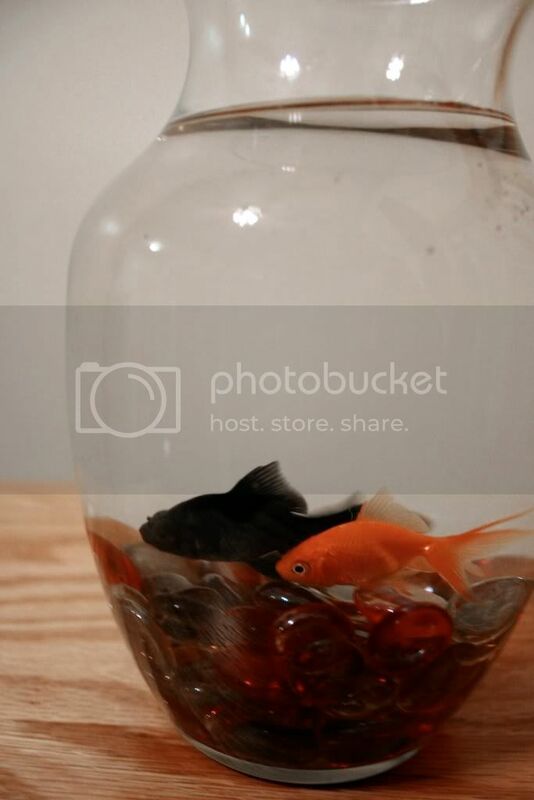 Then Kane, while working at a pet store in Rockford, sold me a goldfish named Golda Mier, who mysteriously passed away three days after I brought her home, while under the care of my mother. Then when I got home, she didn't tell me about her passing, instead she and my sister conspired to lie to me, purchasing a fun bubbly home for the "new Golda," and getting me another fish named Michael Bolton (after the character in Office Space, not the singer) and when those fish passed after an accidental poisoning, she finally fessed up about the passing of the original Golda Mier. It was a heart breaking series of events, but I've found that cat ownership is much easier, as cat can tell you when he's hungry, thirsty, pissed, hurt with a few discernible meows. Anyway, RIP, fish. So I died laughing when I read your love letters. They're priceless. Freaky Friday, but not the movie.